Here's an unexpected factoid: the commonly held belief that the average Canadian pays more taxes than the average American is an old wives’ tale. 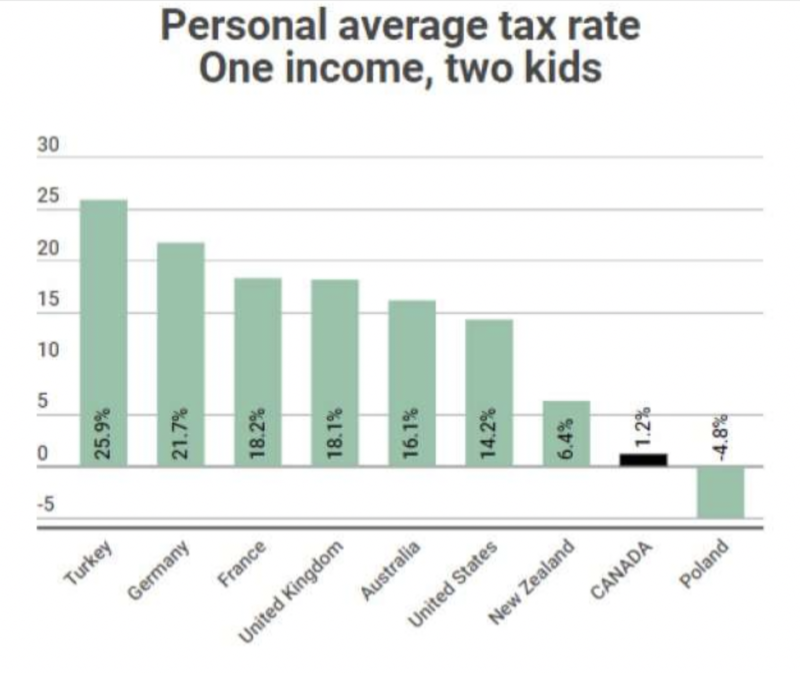 A 2018 study by the Organization for Economic Co-operation and Development (OECD) showed that the average single Canadian with no kids paid 22.8 percent of their income as taxes in 2017, ranking as the 11th lowest among the OECD’s 35 countries. It also compares to 26.1 percent by the average American. But that’s not all. The difference is a lot more extreme for households with children, with the average married Canadian worker with two children only paying 1.2 percent, good for the 32nd lowest amongst OECD nations and nearly 12x lower than the 14.2 percent that a similar demographic in the U.S. doles out to Uncle Sam. Naturally, you would expect that Canada’s generous tax system is due to an incredibly efficient and “fair” tax system whereby nearly everybody pays their dues. Well, spoiler alert: only 60 percent of Canadians pay an effective tax to the government. On average, 40 percent of Canadian households end up paying zilch towards federally and provincially funded expenses including education, healthcare, social services, public safety, national defense and even the good old Canada Revenue Agency. On the other hand, 20 percent of households end up stomaching more than 70 percent of those costs. It’s a startling fact that even Trudeau probably would not want many Canadians to know. The Canadian tax system certainly appears lopsided. But how exactly does 40 percent of the population end up paying zero taxes? To answer that question, the Fraser Institute’s Canadian Tax Simulator 2017 looked at the bottom 40 percent of Canadian households by income. They found that the 40 percent of households fell in the $0-80,843 income bracket and paid 4.6 percent of the country’s total personal tax. That might look like a really low number. Surprisingly, it still gets even lower because federal and provincial give back all of the tax…and then some. The CRA online tax calculator can help you get a grip of how so many households wind up with a zero percent tax bill. To better drive home this point, let’s run three different scenarios reflecting different income levels through the calculator. • Scenario #1—this hypothetical household has three children aged 1,4 and 6 years and two parents with each parent making $22,650 for a total household income of $45,300. Using the Ernst & Young personal tax calculator, this household should pay a total of $4,564 in federal and provincial income tax, which falls to the 20th percentile mark as per the Fraser Institute or smack in the middle of the bottom 40 percent in income bracket. In reality, though, this group receives tax-free benefits of $19,321.96 and ends up with net receipts of $14,758 --from other taxpayers. • Scenario #2—this demographic is similar to the first but with a household income of $60,420, or the 30th percentile. Assuming no deductions, this household should pay $7,596 in income taxes according to the Ernst & Young calculator but instead receives $13,738.32 in tax-free benefits and ends up with net receipts of a cool $6,142—again from other taxpayers. • Scenario #3—this household is similar to the first two but with a household income of $80,844, which falls in the 40th percentile. Again assuming no deductions, this household should pay income tax of $11,690. In reality, it only pays $1,408 after receiving $10,282.44 in tax-free benefits. Whether or not Canada’s represents a fair tax system is a subjective issue depending on where you fall in the tax regime. That said, it’s worth noting that middle-class Canadians probably pay more taxes than middle-class Americans. Some rich Americans, however, pay more than rich Canadians considering that the top marginal tax rate on personal income in the U.S. is 47.9 percent vs. 45.7 percent in Canada. On average, Canadians don’t necessarily pay more income tax than Americans. They, however, do get a lot more from their government in terms of social services. America’s $3.4 trillion-a-year in universal healthcare might be unrivaled anywhere on the globe yet the country’s 78.8 years life expectancy only ranks 27th in the OECD, while its child mortality rate is the 4th highest. In contrast, life expectancy in Canada is significantly higher at 81.7 years despite the country’s $4,500 per capita healthcare spend vs. $9,000 in the US. So what exactly do Americans get for their taxes? The world’s most powerful national defense. The country’s annual defense spending of $611 billion is more than China, Russia, U.K., France, Japan, Saudi Arabia and India combined. I believe there is some information you need to clarify, these are all T-4 income stats, by employees wage not employers. There are different provincial tax levels. In 2015 they ranged from 29 to 39 percent marginal income tax depending on province. A small business owner will pay way more income tax. Most low income recieve welfare, or income subsidies. Even though they pay tax, they recieve more funding than the wealth they create. Because of the varied tax by province the federal government has a equalization program. It’s nice in theory but has created a situation where the minority provinces with surplus GDP have to pay the larger ones with no GDP, but large social security net systems. So between the income tax and ferderal government sales tax and provincial sales tax the avg Canadian will pay close to or over 53 percent of income (tax variables between provinces) into federal or provincial coffers. I find the article title misleading. If you look at it that way then yeah everyone who is on some sort of social security net (unemployment insurance, federal pension, federal employees, welfare, low income housing) will recieve more than they get charged income tax. But it’s a one sided horrible way to look at it. We have people here than die in waiting rooms as any foreign medical tests (cancer, heart, lung, MRI) are invalid in Canada, and the ones whom do not recieve services are left to pay the tab, I pay for everyone’s 10,000 cash back on electric cars but can’t buy one for myself, I pay for that guys ED medication even though mine works and I pay for other provinces to ship oil from Saudi’s Arabia, instead of buying Canadian oil. That’s what you are essentially pushing for.